A mountain home architect has unique skills. Mr. Soellner’s website: www.HomeArchitects.com , has numerous articles he has written for various publications at their request, including major real estate firms, magazine and books worldwide. These publications focus on luxury home architects and architecture with information about mountain home windows, mountain roofing, mountain wall siding, mountain foundations , the work of a mountain home architect in some of the issues, and other subjects of interest to people desiring specialized knowledge about residential projects in steep terrain. Mr. Soellner has 40+ years experience designing homes, having begun when a teenager. Since then, his work has included both residential and commercial projects all over the world. His passion focuses on being a mountain home architect, and this shows in his work, including his own Falcon Cliff Lodge and his latest Mountain Retreat Series, with the most unique floor plans in home design. 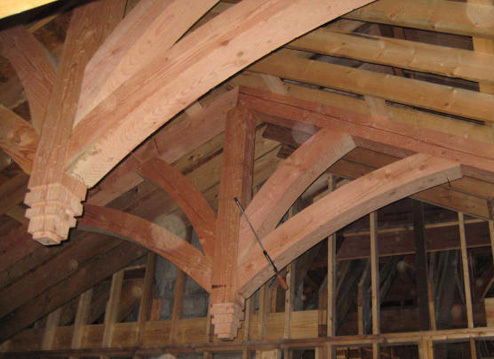 Mountain home architect Rand Soellner designed these custom timber frame trusses in this estate home designed by Soellner, now under construction. (C)Copyright 2007-2010 Rand Soellner, All Rights Reserved Worldwide. A mountain home architect has an advantage over mere home designers, as licensed architects have documented university degrees. Mr. Soellner holds a Master’s degree in Architectural Design from a leading accredited school of architecture. He and other registered architects also have had monitored apprenticeship terms of service. They also have demanding architectural licensure exams to insure that only the most qualified and deserving professionals become licensed practitioners. Mr. Soellner is licensed in multiple states. He also holds an NCARB certificate (National Council of Architectural Registration Boards), which is typically only issued to those most experienced of licensed architects with about 10 years of positive practice. Mr. Soellner brings this considerable expertise to bear on a unique design specialty as a mountain home architect. While architects are also considered as designers, designers can not legally be called architects. These days, new homes have strict energy requirements, so your Architect knows that your house plans must have higher levels of insulation (which improves your “green home” rating and lowers your monthly energy costs). There are a host of other requirements that a mountain home architect accomplishes for you. Mountain home architect Rand Soellner designed this estate home in Western North Carolina, now under construction. 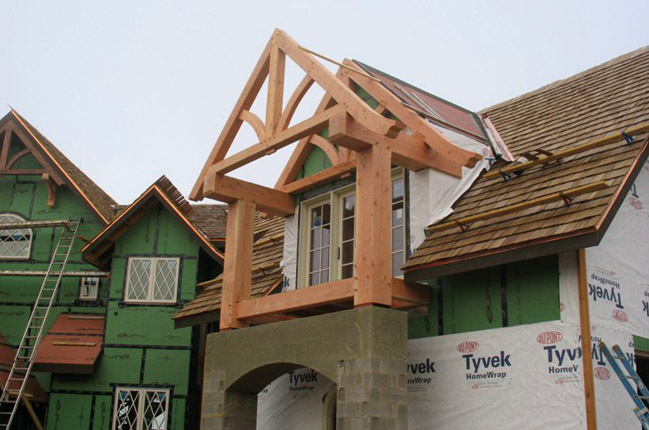 Here, you can see the timber frame for an upper level porch being installed. (C)Copyright 2007-2010 Rand Soellner, All Rights Reserved Worldwide. photo courtesy of Koenig Homebuilders. A mountain home architect is aware of topographic challenges. A mountain home architect knows that mountainous environments are particularly demanding, as the geology is typically unique, with foundations often on sloping granite cliff sides, rainfall greater, mold issues more complex and atmospheric requirements having great impact on windows and other design aspects. A mountain home architect has a unique position in this situation, with the unique skills and experience to handle your custom residential design project. Mountain home architect, timber frame architects, post and beam architecture, green home design, custom homes, Atlanta home architects, Denver residential designers, Asheville home architecture, Cashiers NC architects, Highlands architecture, Brevard NC homes, lake tahoe, newport beach, deer valley, utah . *per organic Google searches 2006-2009.